The Toyota Starlet was a small sub-Corolla/Tercel pint sized jelly bean that was produced starting in 1973 and ending in 1999 when it was replaced by the Vitz. The Starlet was sold new in the USA, but this next one comes as a JDM import (YO!) complete with right hand drive and a clean federalized NC title. 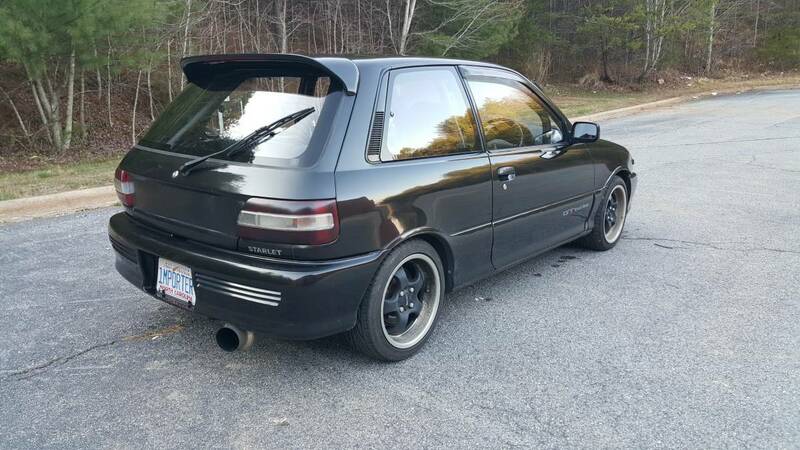 Find this 1992 Toyota Starlet GT Turbo offered for $8500 in Asheville, NC via craigslist. Tip from Rock On! Up for grabs is this unique 1992 Toyota Starlet GT Turbo recently imported straight from Japan. Equipped with the 1.3L 4-cylinder 4E-FTE turbo engine with a standard 5-speed transmission. Engine runs very well with no issues, turbo spools great with the transmission and clutch feeling solid with no grinds at all. This example has a little over 155,000 km which translates to around 96,000 miles; though the mileage will go up slightly as I am still daily driving the vehicle. I've been able to maintain around 32-36 mpg's so the Starlet is a real gas saver without sacrificing any fun of driving this little hot hatch! Exterior is in great condition with just a few tiny dings as expected on vehicle of this age but no major dents or scrapes along the entire vehicle. Paint is a lighter black with a heavy metallic flake added which makes this car pop in the sunlight. Vehicle does have a facelift update from a 1994 model making the front end look much more aggressive. Works 5-spoke wheels all around with with a lot of life left in the tires. 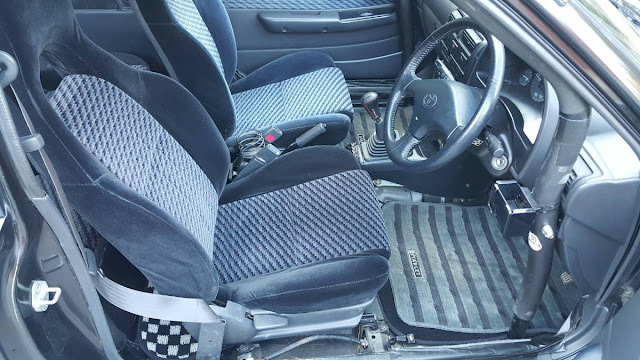 Interior is in amazing condition with original seats and floor mats in near perfect condition. Factory steering wheel and a TRD shift knob both feel great with no material separation occurring on either. A/C blows cold air as expected or you can pop open the rear side windows for some subtle air flow without being blown away. I do have the spare tire and jack for this vehicle; took them out to clean the car and forgot to put them back for the pictures. Also to note in the interior there is a bolt-in style roll cage installed in Japan which only adds to the sportiness of the pocket rocket! Car is Federally legal, comes with all import paperwork and a Clean NC Title. Feel free to contact me if you have any questions on this vehicle or on having a vehicle imported from Japan. 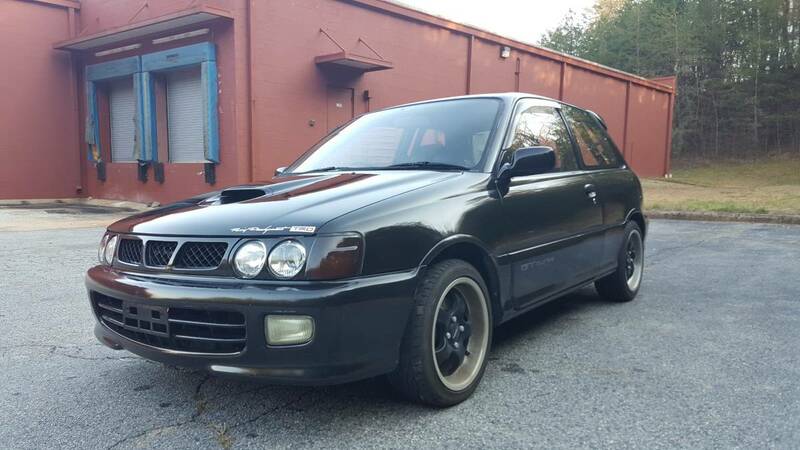 Hey I'll be in Asheville next week if anyone has any tips on fun scenic driving roads nearby or if you want me to check out this starlet I know nothing about. I found a 944 on Turo for $40 a day which seems like a steal and much more fun than the truck we'll be taking out there. Planning to do the tail of the dragon on the way there. Thanks! Beautiful road..good eats in Franklin.